This article will cover all of the above. *Note: A major road is defined as one with priority over another road at a junction. When turning left, head to the left of the road, or go to the centre of the road (on a two way street) if you plan to turn right. You’ll normally need to slow down to take a junction, so roll of the throttle gently, apply the brake if necessary, and select a gear which will take you through the corner without a further change. Look around the corner as soon as you have visibility. Watch for traffic and hazards. As with all manoeuvres, perform the OSM PSL procedure. Check your mirrors first, and indicate to show your intentions. Before you change your position, it’s sensible to do a ‘lifesaver’ over the shoulder check to watch for cyclists or other motorcycles which may be undertaking. As you move towards the left you’ll probably need to reduce your speed and select a gear which will take you through the corner. As left hand turns are usually sharper than right handers you may need a lower gear. Look through the corner as soon as you can see, decide to take the bend, then start to move towards the centre of the road and cancel your indicator. 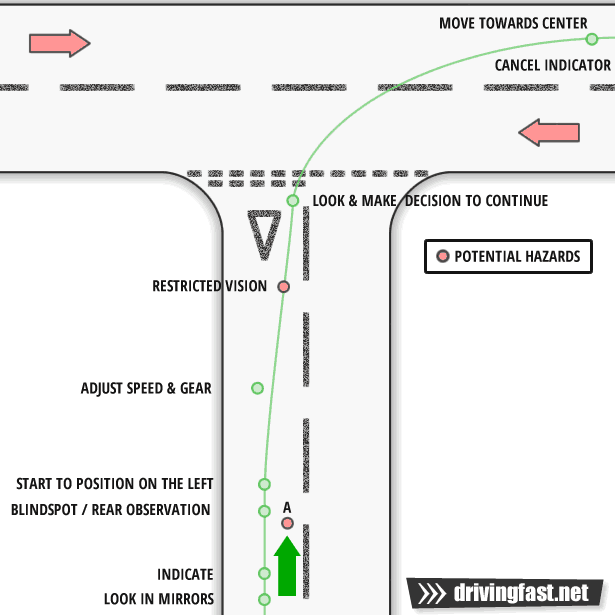 Follow the approach procedures of a left turn from a major to minor road, however when turning onto a major road, the chances of having to stop are greater due to fast moving traffic which does not need to give way to vehicles entering the road. Because of this, you’ll need to look at the speed and distance of approaching traffic and make a judgement about whether you need to stop or whether you can continue without having to put a foot down. If your vision is restricted it’s sensible to stop until you’re confident of a safe turn. If there is a stop sign, you must stop. D. Fast traffic approaching on the other side of the road. When turning into a minor road on the right, you will need to cross the lane with potentially fast oncoming traffic and in addition you may hold up impatient drivers behind you. 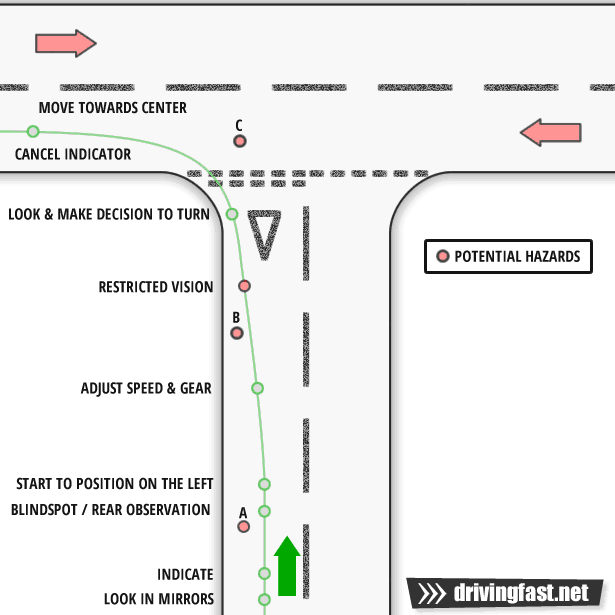 Follow the OSM PSL procedure, use your mirrors, indicate to the right and perform a lifesaver over your right hand shoulder before moving over to the centre of the road. Be aware of oncoming traffic, traffic behind you and road users emerging from the junction. Stop if necessary until a break in the traffic, and turn right being careful not to cut the corner which may inconvenience cars waiting to emerge. As with the over junctions, use the OSM PSL procedure. 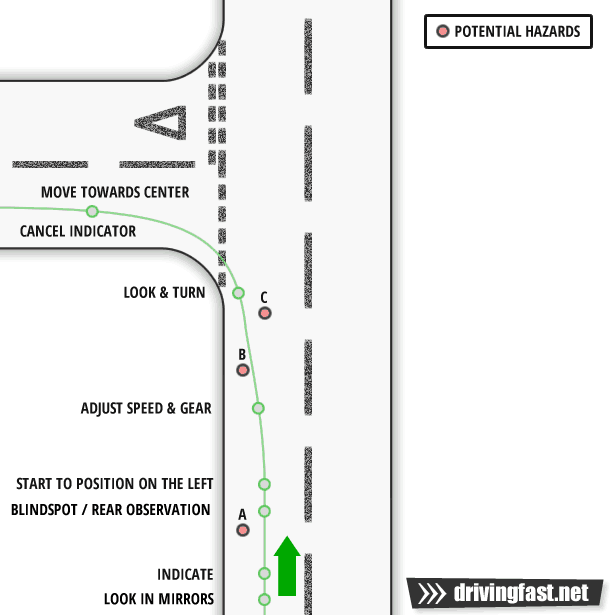 Look in your mirrors, indicate, perform a right shoulder life saver check before moving to the centre of the road. You might have restricted vision of traffic before you get close to the junction which means you may need to stop. If there is a stop sign you must stop. Look both ways and be careful of fast moving traffic. 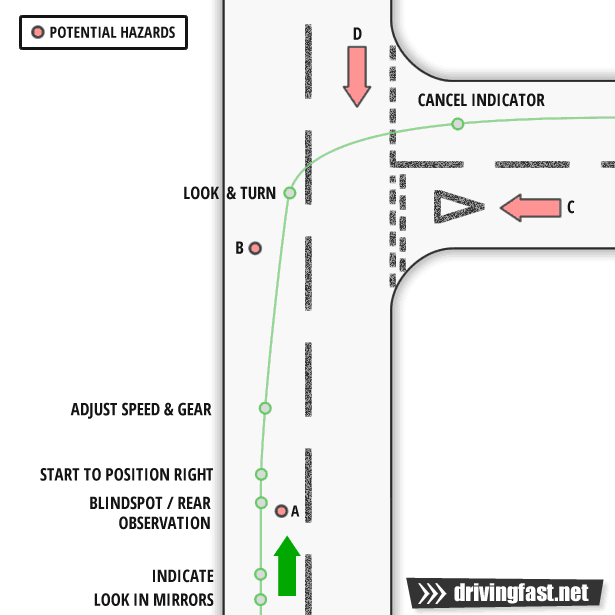 Emerge from the junction when safe, accelerate up to the speed of oncoming traffic and cancel your indicators.